Commentaire: Entièrement garanti. Expédié à partir du Royaume-Uni, veuillez noter que les délais de livraison peuvent atteindre 18 jours. Faced with the deadliest peril the universe has ever known, the world's greatest heroes left the Earth to battle a nightmarish evil... and they never came back. Now, only their teenage sidekicks remain. Will the Danger Club unite against this unknown cosmic menace, or will their struggle for dominance destroy them? Collects Danger Club #1-4 and includes a special never-before-seen sketchbook section. 4,0 sur 5 étoilesand they both enjoyed it. This was purchased for my sons, both 13yr old. I read that it may be a little dark and heavy for kids, but I didn't see anything that they haven't seen 100x on TV or in a video game. They devour these books, so it was ready before the christmas wrapping paper had been removed from the floor. Both of them said it was an interesting story line, and they both enjoyed it. Danger Club is one of the best Comic books out for Image. The art is amazing and the story is compelling. I love it. A must read. 5,0 sur 5 étoilesThey should make 'em all like this. After a rash of comics set in "the real world" it is refreshing to see a comic totally and unapologetically immersed in a comic book world. Add to that the intelligence with which the comic is written and the intelligence it gives its audience credit for having and you have a new classic. Every single thing in this book has importance to the story - even the covers provide a piece of the puzzle, a glimpse of backstory that explains a fragment of the implied history and depth to the characters and universe. My only problem is that I have to wait for Volume 2! I want it now!!! The premise of Danger Club is that all the superheroes left to battle some peril and didn’t return, leaving their teen sidekicks to take up the slack. Played for laughs, that could be a pretty good premise, but Danger Club takes itself far too seriously. In the first installment, a dude with the rather unimaginative name Apollo wants everyone to serve and worship him, naturally enough, so the Danger Clubbers, despite being second-string heroes, take him on. The Clubbers also have unimaginative names -- Kid Vigilante, Kid Victory, Fearless, the Magician, and so on -- as well as no discernable personalities, despite some heavy-handed attempts at family drama. 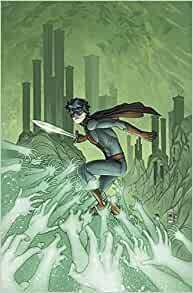 By the second installment, the sidekick teens are scorned and feared because, well, things like that happen when writers reprise unimaginative storylines that have been done to death. Hey, did you know that if you tilt a particular book in a bookcase the bookcase will swing open revealing the entrance to a superhero’s secret lair? Is there anything in this volume that hasn’t been done a thousand times before? Overwrought, cliché-ridden prose and cartoonish art contribute to my disappointment with this volume. What we have with Danger Club is perhaps the most obvious next stage of superhero comics: specifically, the hijacking of 'teen titan' characters and turning them into uber violent, nihilistic, and anarchy-inspired bundles of angst and nastiness. Most of the pages are mind-numbing brutality especially focusing on turning faces into mashed potatoes (you don't get broken body parts, you get bloody marbled faces over and over, ad nauseum). Unfortunately, despite what the author intended, the gore isn't counterbalanced by nuanced worldbuiling and so the statements being made fall flat: this hasn't Lord of the Flies' trenchant insight or A Modest Proposal's exuberant outrageousness. It's just four episodes of mindless violence; which, admittedly, may in fact be the greatest statement of all made by Danger Club about the 2010s. Story: Kid Vigilante and his group of 'former sidekicks' are reeling from the loss of the adult superheroes and villains - and the betrayal from one of their own. Kid Vigilante has the super power of 'knowing everything' - and he hatches a plan to take down his new nemesis while also trying to make the world see that a bigger threat is coming. But what is the point of bringing down a villain when the whole world hates you anyway? And what exactly is this big alien threat that Kid Vigilante keeps talking about? We're thrown right into the story - abruptly and confusingly. I had to double check that I hadn't missed a previous volume somewhere. So the first part is pretty much going along for the ride and hoping someone finally reveals some back story for the characters and worldbuilding. Yes, this future is at first presented as utopic and slowly turns dystopic by the end. Yet only the teen protagonists of Kid Vigilante's little team seems to have noticed or cared. Why? Don't ask - you won't get answers in this volume. And while I typically applaud authors who don't feel the need to overtell a story, I'd still like to see writing intelligent enough to subtly yet effectively lay down a world for us to explore. I just didn't find that here. Finally, most problematic for me are the themes. E.g., taking a character named Apollo with sun-like powers and making his kyrptonite the moon felt juvenile, at best. Better writing pairs a night-shadow (e.g., Midnighter) with the sun to counterbalance light and heat. Similarly, I kept waiting for a pay off with the main character, whose only super power was that he knows everything, but nothing ever really came off it other than 'he has a plan' and it involves getting everyone beat up - regularly and thoroughly. It just seems that so much has been recycled but without enough changes to make it original. Was Batman's Robin always an emotionless 'know it all.'? Because his counterpart sure is here. So yes, this could eventually be a story that goes somewhere and makes sense later. But the clues dropped thus far don't intrigue and we are not given many reasons to want to continue - especially since the the plot presages only more violence. Ending on a cliff hanger rather than completing a sub story arc further distances since it might have been a chance to create a reason to stay through more background information. The art is serviceable. Reviewed from an advance reader copy provided by the publisher.